As part of a blog tour – you get asked to do lots of different things. Just after our last tour finished, Jill invited me to participate in her Five on Friday slot and I just thought I’d add it in here – it’s a little different…. My favorite colour is green – although I’ve tried to talk myself out of it and choose something that doesn’t have forty variations! You can check out Jill’s Book Cafe here! 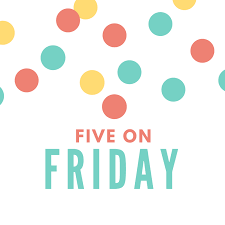 If you like books – there are lots of great reviews and plenty of other writers there talking about their Fives!